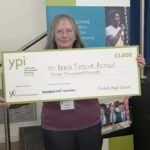 A team of third year pupils at Firrhill High School, Edinburgh were chosen today as the winners of their school’s Youth and Philanthropy Initiative for 2019. As a result, they received £3000 for Brain Tumour Action. Beth, Rosa, Lucy and Conal competed against seven other teams, all of whom spoke knowledgeably about their chosen charities but “our” team had not only prepared their material meticulously, they had then gone a stage further by visiting our Support Group after school and talking to patients,relatives and friends for over an hour. While there they took a series of photographs which they subsequently made into a video montage with music, captions and further information which was presented with great sensitivity. This really brought to life the challenges that face anyone who is living with a brain tumour. Jennifer and Lynne attended the Final and were thrilled to accept the winning cheque. A huge thank you to Conal, Lucy, Rosa and Beth for their work and commitment. The University of Edinburgh is delighted to invite you, your family and friends to join us for an evening of short talks and information sharing with our brain cancer researchers and clinicians. In 2018, the University of Edinburgh, in conjunction with colleagues from University College London, was awarded the CRUK Brain umour Centre of Excellence. In celebration of this, we would love to share with you how the award is shaping the future of brain tumour research in Edinburgh. The event is very informal and will give you the opportunity to ask our team any questions you might have about their work following their short presentations. After the presentations there will be refreshments and time to meet the team. Registration will open at 5pm in the Main Reception at the Institute of Genetics and Molecular Medicine and the talks will start at 5:30pm. MOMENTUM – Strengthening Voices, Making Choices. The first Scottish Brain Tumour Symposium is taking place in Glasgow on 21 May 2018. This event is being organised by brainstrust and Brain Tumour Research in collaboration with the Beatson Cancer Charity. The event is designed for brain tumour patients and carers as well as healthcare professionals. The agenda will include expert speakers from many areas of brain tumour research and also discussion about the effects of being diagnosed and living with a brain tumour. It will include the latest news on advances into treating and managing brain tumours. This has been ratified by the association at our recent Annual General Meeting. Janyne Asfeth, a nurse lecturer and PhD student at Edinburgh Napier University is undertaking a realist evaluation of Holistic Needs Assessment in neuro-oncology to help understand better how complex interventions help in some circumstances but not in others. She would like to interview adult patients and carers. The structured Interviews with specific questions will last between 30-60 minutes and will be recorded and anonymised, then evaluated. These interviews can also be undertaken by phone. She can travel to volunteer participants’ homes at a mutually convenient time. If you would like to participate please contact Janyne at j.afseth@napier.ac.uk or phone: 0131 455 5703. The Extraordinary General Meeting on 22nd December 2017 to change to the wording of paragraph 9 (c) of our Constitution, approved the change. Paragraph 9(c) stated: The accounts shall be audited at least once a year by the auditor or auditors appointed at the Annual General Meeting. This now reads: The accounts shall be subject to external scrutiny in line with the relevant requirements of legislation. This follows advice from our Independent Examiners, Scott-Moncrieff, which brings our Constitution into line with current Best Practice in the matter of external scrutiny of our accounts. Our accounts were scrutinized and duly submitted to OSCR before the last day of December, 2017. Brain Tumour Action is raising awareness about the signs and symptoms of brain tumours in young adults where delays in diagnosis sometimes occur. We’re working to create a short video, featuring people’s own experiences. If you are between 21-39 and have ever been diagnosed with a brain tumour we’d really like to hear from you. Alternatively, if you know someone who may be interested, please share this post. All first-hand accounts will be voiced by actors to maintain complete confidentiality. ‘It’s All in My Head’ by Jo Barlow. Jo had brain surgery to remove a hemangioblastoma from her cerebellum in May 2016. Hemangioblastomas are rare, low-grade tumours that occur in the blood vessels of the brain and spinal cord. As she could find no information from others who had had similar surgery she decided to write her own book “It’s All in My Head” about her experience. The Royal College of Radiologists (RCR) has just published a new edition of its guidance on the application and best practice of interventional oncology which may be of interest. Interventional oncology is a fast-moving discipline which directly overlays the RCR’s two specialities of radiology and oncology; it concerns both the diagnosis and interventional treatment of cancer using image guidance techniques. The College’s original guidance, released in 2012, has been revisited to ensure clinicians remain up-to-date. The guidance can be downloaded for free from the RCR website: https://www.rcr.ac.uk/publication/interventional-oncology-guidance-service-delivery-second-edition. The Brain & Spine Foundation has launched the app ‘My Brain and Me’ for young people with any acquired brain injury including a brain tumour. Everyone who has an acquired brain injury is unique but many families report personality changes and anxiety issues. The app, which works as a mood diary, allows the young person to record their feelings, to aid them in making sense of their emotions and to encourage them to seek help when needed. It is available to download free of charge in the App Store and Google Play. Musician Rosie Glass, whom we featured in our KITE news letter, 2015-16 has launched her new blog, drawing attention to the mistreatment of patients with ongoing disabilities and campaigning to recognise their rights. See her blog HERE and follow the links at the bottom of the Posts. The Centre needs at least £100,000 to fund the new project and has just received grants from Brain Tumour Action, the Astro Brain Tumour Fund and from the Jessica Hope Foundation. The research and fundraising is being championed by 4-year-old William Frost and his family from Newark, Nottinghamshire. William was diagnosed with an ependymoma brain tumour 3 years ago and is being treated at the Centre. See: www.makewilliamwell.com for more details. The Royal College of Radiologists (RCR) has today written to Prime Minister Theresa May in support of concerns raised in a letter to the PM by the Royal College of Physicians of London (RCP) about the dire state of NHS services and the urgent need for investment. The RCP view that the NHS is underfunded, under-doctored and overstretched, is borne out from data collected by the RCR which reveals a quarter of a million patients waiting over a month for the results of their X-rays and scans and the poor cancer outcomes in this country. The RCR is urgently calling for more clinical radiologists and more clinical oncologists, and the need for a sustained program of investment in imaging and radiotherapy equipment. This toolkit was created in partnership with national awareness campaign HeadSmart to bring together a collection of resources for clinicians and parents, to assist in the recognition and referral of brain tumours in children. The RCGP are promoting the Brain Tumours in Children Toolkit throughout November. As reported in The Scotsman scientists from the Cancer Research UK Edinburgh Centre will receive £3.7 million over the next five years for their research into tackling brain tumours. The funding will support scientists taking samples from patients’ tumours during surgery and then growing these brain tumour cells in the lab to study the faulty molecules that underpin the disease. This will help them discover better ways to treat and diagnose brain tumours, which still have poor survival rates. In another exciting development Dr Noor Gammoh is to receive £1.64 million from Cancer Research UK to support her research into glioblastomas. 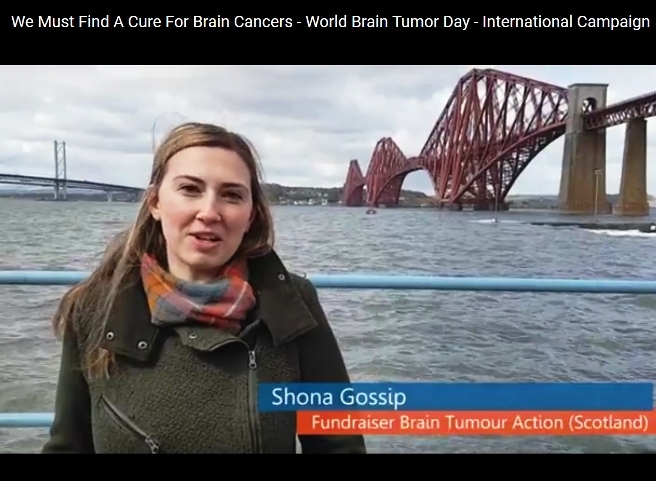 Around 265 people are diagnosed with glioblastoma in the brain every year in Scotland but the treatments currently available are limited and life expectancy after diagnosis is only about a year. Melissa Pilkington, Research Assistant at the Department of Psychology, University of Chester, is involved in this study which is examining the psychological transition from end-of-treatment to recovery for cancer survivors. They are actively seeking recruitment. “The comic is about my mum who was mentally ill for a number of years which we later discovered was a brain tumour. During her illness her life changed considerably- she split up with my dad who she had been with for 42 years, lost her job and friends. She has since made a full recovery and is slowly putting her life back together. I have written it for her as she remembers very little of the five or so years she was ill and also to help my family clarify what happened. It is about a medical condition as well as families and breakdowns of families. I hope it will touch people who have been affected by long term illness as well anyone who has been embroiled in an emotional issue with loved ones. Some excellent points were made in a most civilized, cross-party discussion. It is hoped that the broad consensus of opinion expressed will lead to greater funding for training, diagnostic tests and treatment as well as for research. A fund raising company Recycling for Good Causes has offered to raise funds for us by marketing and selling small items we donate to them and returning to us 75% of any profit that arises. Their scheme is used by many major charities. Unwanted banknotes from ANY country of any age, so all of those obsolete pre-euro notes are a perfect start! Please do not send coins to the freepost address above as the postage costs will far outweigh your donation. You can also donate your used stamps to raise funds for Brain Tumour Action. All kinds of stamps are welcome, on or off paper. You must put the correct postage on the envelope. It is not free. You may know that the House of Commons Petitions Committee has been looking into funding for brain tumour research as a result of this petition. The Committee is now preparing its report. The report will present the evidence the Committee has heard and make conclusions and recommendations which the Government will respond to. The Committee has agreed to schedule a debate on this petition after its report has been published. NHS inform is the National Health Information Service providing a coordinated approach and single source of quality assured health and care information for the public in Scotland. Click here to find us and our fellow brain tumour charities. Listening Books is a UK charity providing thousands of fantastic audiobooks in three easily accessible formats: downloads, internet streaming and MP3 CDs. It has some 38,000 members and the service is available to anyone who has a disability or illness which makes it difficult to hold a book, turn its pages, or read in the usual way. The library caters for both adults and children. The library is available to thousands of pupils with special educational needs through a partnerships with regional online grids across the UK. Katie Sheen from the Astrofund has created a new resource to give wholistic support. It can be found at Soul Nutrition. A free trial is available and Katie would welcome your comments and feedback. Part of the profits from Soul Nutrition will go to support research into low grade gliomas. Do of course shop around and let us know what other companies you may find.